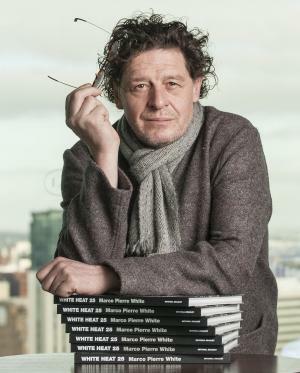 Marco Pierre White was born on the 11th December 1961, in Leeds, West Riding of Yorkshire, England, and is a celebrity chef, restaurateur and TV personality best known to the world for appearing in the TV reality cooking shows “Hell’s Kitchen” (2007-2009), and “MasterChef Australia” (2011-2016), among many other differing endeavors. Have you ever wondered how rich Marco Pierre is, as of early 2017? According to authoritative sources, it has been estimated that White’s net worth is as high as $40 million, an amount earned through his successful career. He is also a famed restaurateur, opening and running several restaurant chains, including White Star Line Ltd, MPW Steak & Alehouse, and London Steakhouse Co, among others, which has also improved his wealth. Marco is the third son born to Frank White, who also was a chef, and Maria-Rosa Galina. Marco is of Italian ancestry from his mother’s side. He went to Allerton High School, however he dropped out of school before obtaining a diploma and decided to pursue a career as a chef. Firstly, he joined the staff of Hotel St. George in Harrogate, and after a while became a part of Box Tree in Ilkley. Once he turned 16, Marco moved to London with only £7.36, a box of books and a bag of clothes, but soon enough found engagement at Le Gavroche, a training as a commis with Albert and Michael Roux. Little by little Marco was improving, and then started to train under Pierre Koffman at La Tante Claire, but moved further to Le Manoir to work for Raymond Blanc. His next stop was Ninety Park Lane, where he worked for Nico Ladenis, but dissatisfied with his progress, Marco ventured out on his own, firstly working in the kitchen at the Six Bells public house in the Kings Road, with his own assistant, Mario Batali. After that, in 1987 he opened his own restaurant, called Harvey’s in Wandsworth Common, London. He received two Michelin stars for his restaurant in two years, and then worked as a chef-patron of The Restaurant Marco Pierre White, located in the dining room at the former Hyde Park Hotel, for which he received his third Michelin star, all stars coming before he hit 35 years of age, thus becoming the youngest recipient of three Michelin stars at only 33 years old. Unfortunately, Marco wasn’t fully satisfied with his career, as he felt that people who had less knowledge than him, disrespected him and he served them the best way he possibly could by his retiring from the kitchen in 1999, also returning his Michelin stars. He then launched career a on TV, and as a restaurateur; he appeared on the show “Gordon Ramsay: Beyond Boiling Point” in 2000, and since then has become quite an influential figure in the food industry. He has made appearances in such shows as “Hell’s Kitchen” (2007-2009), “The Chopping Block” (2009), “MasterChef Australia” (2011-2016), and will serve as head chef on the new show “Hell’s Kitchen Australia”, which is scheduled for release late in 2017. Regarding his personal life, Marco has been married three times and has four children. Since 2000 he has been married to Mati Conjero; the couple has three children. His first wife was Alex McArthur – the couple married in 1988 and divorced in 1990, and in the process they became parents of a daughter. His second wife was Lisa Butcher; the couple married and divorced in 1992. Children Luciano White, Mirabelle White, Marco White Jr.
1 Marco Pierre White was the world's youngest three-Michelin-starred chef at 33, but renounced his stars when he retired from day-to-day cooking in 1999. 2 Michelin-star chef born in Britain to an Italian mother. Who is Emilia Fox, when did the Silent Witness actress date Marco Pierre White and who is in her famous family?